With two weeks in India, travelers will have enough time to get intimately acquainted with a handful of key cities and sites. To get the most from your stay, you'll want to focus on exploring just one or two regions. Consider going for depth, rather than breadth, and resist the temptation to cover everything in one visit. Just think of it as a reason to keep coming back for more. India is a destination that deserves—and often demands—an unhurried visit. It is dizzyingly dense with natural splendors, UNESCO-listed historical sites, and rich cultural attractions. Factor in long distances and busy transport links, and you’ll want to make sure you have enough time in each location to do it justice. What’s more, the country’s best travel experiences are often unplanned: chance encounters and slice-of-life moments that won’t be found on whistlestop tours. With extreme seasons throughout much of the country, climate will probably at least partially dictate your itinerary. Milder winters are well-suited for trips to South India, while scorching summers or monsoon seasons are the perfect times for exploring higher elevations, like Ladakh. 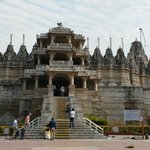 For more on weather in India, check out When to Visit India: Travel Tips for Every Season. Read on and get inspired by two different itinerary ideas for your two-week trip. 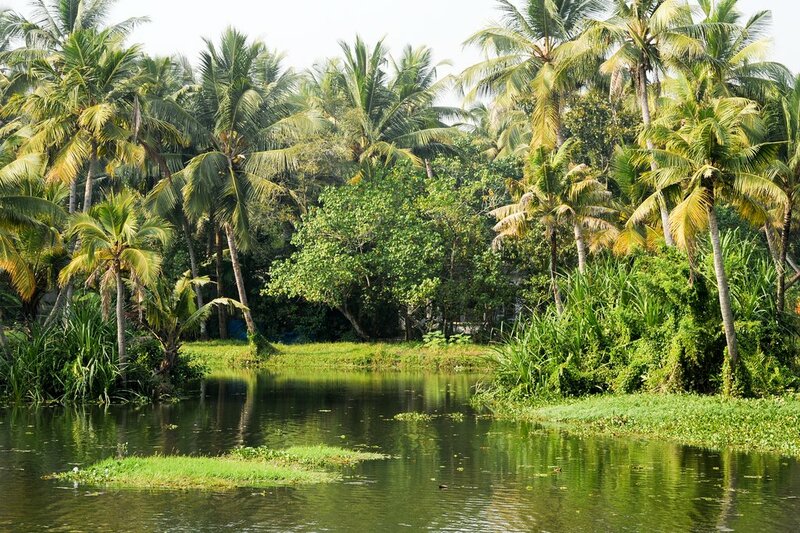 With balmy jungles, imposing hill stations, and ancient stone temples, South India is home to some of India’s most impressive natural and cultural attractions. Add in a handful of buzzing, history-filled cities and you’ve got enough sights to last you for months. As an added bonus, many lack the crowds of northern blockbusters like the Taj Mahal. 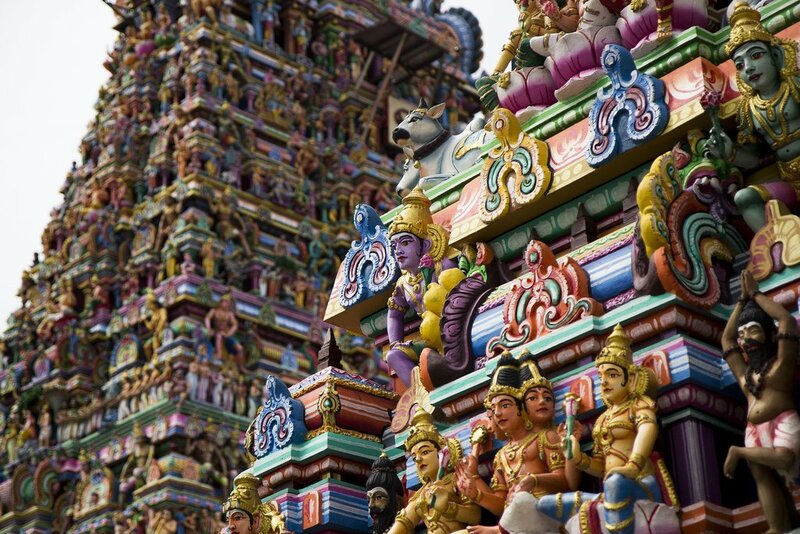 Land in Chennai, where you can get a taste of Dravidian temple design with a visit to Kapaleeshwarar, a massive shrine to Shiva painted in cartoon-like technicolor. Whet your appetite with some classic street snacks like masala dosa, a spicy, potato-stuffed rice crepe, before tackling the full South Indian thali platter, a dozen flavorful mini-dishes that can even come in unlimited portions. From there, hop a bus or taxi to Tiruvannamalai, a laid-back temple town that is part of South India’s hippie trail (in-the-know travelers call it simply “Tiru.”) Buy a plate of offerings to present to Shiva at Annamalaiyar, another massive temple complex that dominates the center of town, or mingle with other travelers over fruit smoothies at one of the many backpacker cafes. The sacred peak of Arunachala, where the Hindu sage Ramana Maharshi was believed to have gained enlightenment in a cave, draws thousands during full moon nights, when pilgrims gather to circle the base on foot. You can head south to the even drier and hotter inland city of Madurai, stopping in other temple towns like Thanjavur (Tanjore) or Trichy. The three ancient cities are known for their towering, colorful shrines, Chola ruins, and frenetic throngs of worshippers, while Thanjavur also boasts an impressive 16-century palace. Once you’ve gotten your temple fix, you can settle back for a stunning drive to Periyar National Park, a sprawling, mist-shrouded nature reserve in the neighboring state of Kerala. 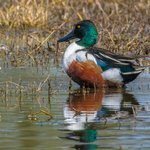 You’ll have a chance to spot tigers, wild elephants, leopards, and sloth bears, and take in the region’s plentiful plant and bird life as you enjoy much cooler climes. From there, you’ll travel to Alleppey, a picturesque coastal Keralan city built onto a network of canals, giving Venice a run for its money. Hop a houseboat for a leisurely cruise on the open waters, where you can get a peek at village life as you float past surrounding communities. 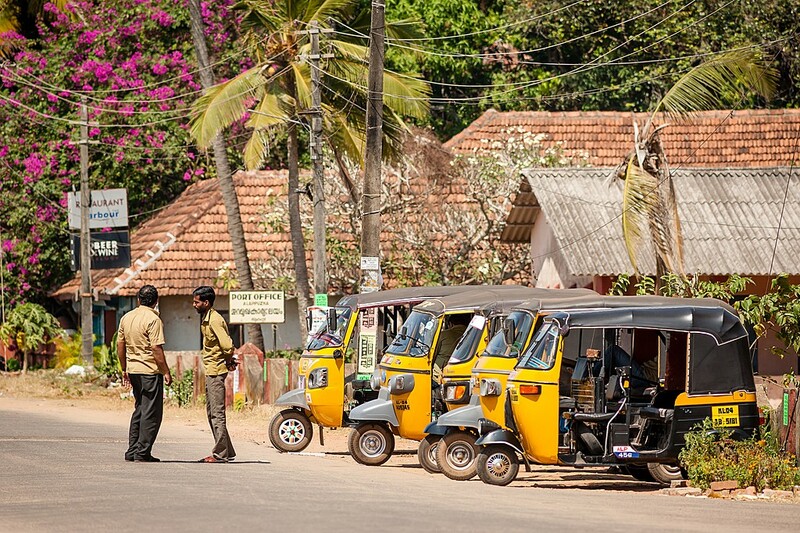 Base yourself in Fort Kochi next, Kochi’s history-filled, oceanside Old Town. Learn about the city’s mixed heritage as you explore the Jewish synagogue, a Dutch palace (actually built by the Portuguese), Muslim spice shops, and Chinese fishing nets. Depending on how many days you’ve allotted to each location, you could fly home directly from Kochi. Otherwise, hop a train to Coimbatore and take a UNESCO-listed toy train up to the cool, flowering hills of Ooty, a British-built hill station known for its mild temperatures and majestic vistas, before making your way back to Kochi, Coimbatore, or Chennai to fly home. Looking for a more outdoors-oriented adventure? Ladakh is a great option. A former Buddhist kingdom nestled high in the world's tallest mountain chain, the craggy desert region is home to spectacular clifftop monasteries, known as gompas, and vast stretches of rippled landscapes, saltwater lakes, and high-altitude glaciers. Although shared and private jeeps are readily available, and even bus links, the most fulfilling way to travel between destinations is on foot, with family homestays offering a unique way to immerse yourself in the culture of India's "Little Tibet." Land in Delhi, India's modern capital that is actually made up of eight different cities, from the 12th-century Delhi Sultanate to British-built New Delhi, headquarters of the Raj. If it's your first time in India, you'll want to allot enough time to take in local sights before speeding off to Ladakh. Take at least a day or two to visit World Heritage-listed Mughal landmarks like Humayun's Tomb and the Jama Masjid, as well as lively neighborhoods like Nizamuddin, famous for its Sufi dargah, and the bustling bazaars and back alleys of the Old City. You can even work in a quick side trip to Agra if you're determined to check off the Taj Mahal. Ladakh is just over an hour by flight from Delhi. For longer trips, you can opt to travel overland, taking the famed Leh-Manali highway through Himachal Pradesh. But with two weeks, you're better off saving on travel time and heading straight to Leh, Ladakh's largest city and de facto capital. The disadvantage is that you'll be more sensitive to the effects of the high altitude. When you arrive, check into your hotel, homestay, or guesthouse and try to stay still for at least 24 hours as your body acclimatizes. 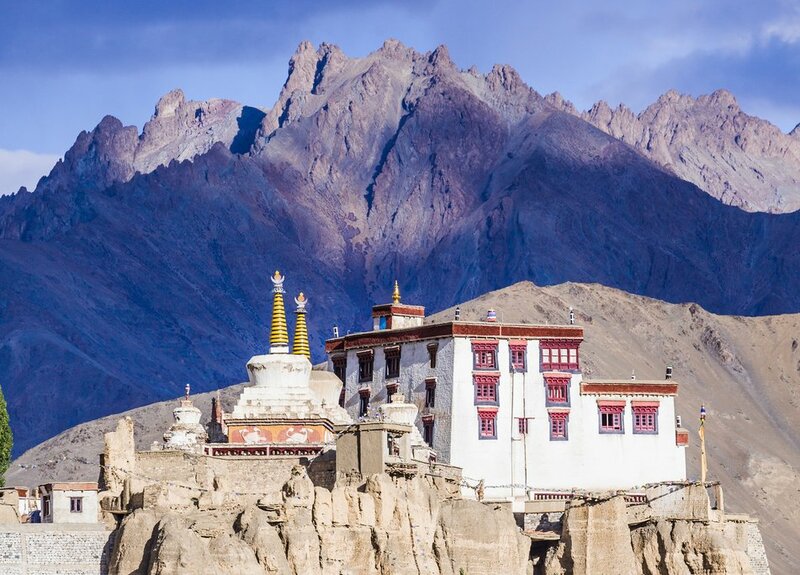 After your rest period, start exploring the city's sights, like 17th-century Leh Palace, an empty, near-ruin that is most appreciated for its panoramic views, and the stunning Namgyal Tsemo Monastery, the city's principal landmark. Then you can widen your circumference to include day trips to the surrounding areas, like the famous beehive cluster of monasteries in Thiskey and the 16th-century palace of Shey, still home to Ladakh's current king. Now that you've fully adjusted, it's time to get moving. From Phyang, home to another hilltop monastery, you can trek to pretty, poplar-lined Likir, whose 11th-century gompa is one of Ladakh's top tourist draws. From there, follow the trail to Yangtang and look for the old chorten that line the roads, remnants of Buddhist stupas. You'll also hit your first high pass with Charatse La (12,467 feet), which looks out over mustard-yellow barley fields. Spend time exploring Rizong Monastery, home to 40 monks, and take a stroll along the river. Then, get a peek at traditional village life with a gentle, scenic trek to Hemis Shukpachen, where you can hunker down over a plate of hot thukpa, or Tibetan noodles, in a Ladakhi homestay. Head next to Tia Village, passing through the fertile oasis of Temisgam, a contrast to Ladakh's more standard moon-like surfaces. In Tia, you can meet a remote community of Buddhist nuns and learn how women have kept alive centuries-old monastic traditions. You'll return to Leh via some of the most stunning parts of western Ladakh, including Lamayuru, the region's oldest gompa, and Alchi, an idyllic village famous for its colorful frescoes. 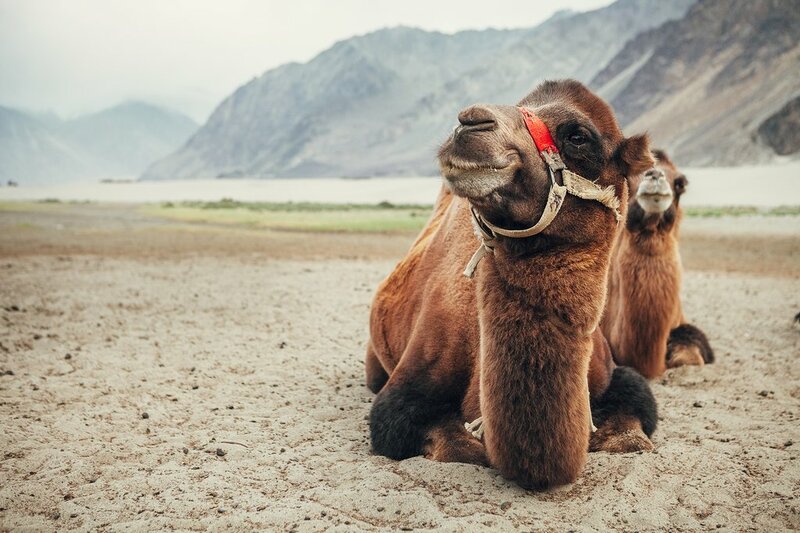 Depending on how many days you've taken in each location, you could make Alchi your last stop, or you could take another few days to explore the Nubra Valley, a white sandy oasis considered by many to be Ladakh's most impressive district. Either way, you'll need to pass first through Leh, and possibly stop to pick up another travel permit, if you haven't lined up all your permits in advance. Then hop a shared taxi to Hunder, once the gateway to the legendary Silk Road, now famous for its resident two-humped camel population, and nearby Disket, a charming, dusty market town presided over by a towering gold seated Buddha. For other trekking routes in the area, check out the 10 Best Treks in Ladakh. And see more ideas for two weeks in India here.